Why Did We Find a Baby Snapping Turtle? For the first time in over 10 years of walking every part of the park, we came upon a turtle: to be exact a baby snapping turtle. It was just larger than a bar of soap, as cute as a snapping turtle could ever be. But finding it on the trail brought mixed feelings. Why? Because we found this baby trudging along a trail that made no sense. Snapping turtles need deep enough water and mud to bury themselves in, in the fall, in order to survive the winter. This baby snapper was headed up a trail that does not lead to a turtle-safe wetland for a very long distance, if ever. 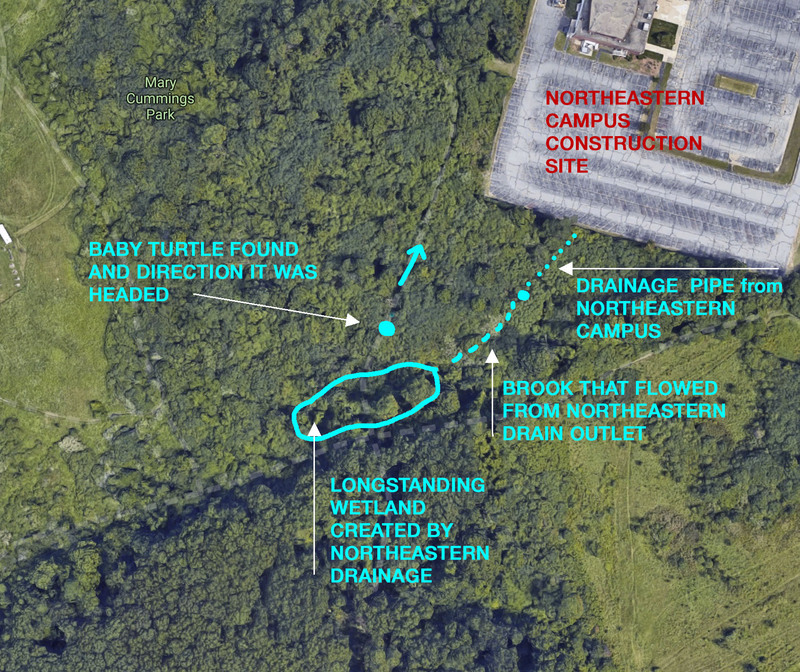 We suspect the following took place: during the construction of the new building at Northeaastern, the drain pipe that has been feeding a wetland on the hillside since the 1950s, has probably stopped supplying that wetland with water. So the the wetland, shown on the map below, may be drying up, despite the recent rains. Perhaps the baby snapper was looking for a wetter place to live, a place with deep enough water to survive winter. We did not move the turtle down to the wetland, instead, we assumed that Nature knows best. But we wonder: Did the construction at Northeastern drive the little turtle off to look for a wetter home? 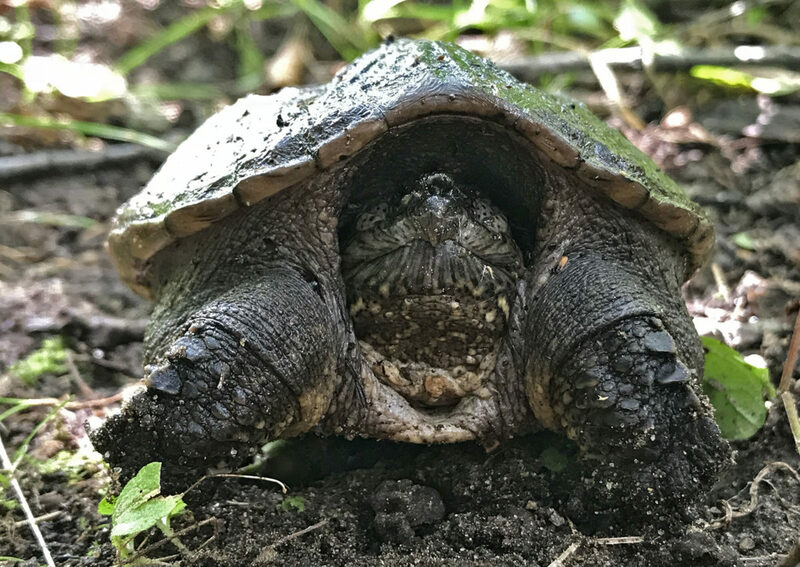 Snapping turtles are not endangered. Even if it were true, and provable, that the Northeastern construction has driven this baby turtle from its home, nothing legal could be done. During the hearings about the new construction at Northeastern there was much discussion about the runoff from the parking lot into the park. And Northeastern was called upon to reduce the runoff. Now there is a large drone research cage and a new building where on much of that parking lot. So the amount of water draining into the park will be much less. And the un-recognized wetland on the side of the hill may be reduced or even dry up entirely. It was the accidental result of the military building a paved area with a missile base and routing the runoff water into the park. So a little baby turtle that will crawl along for weeks, looking for deep enough water to sustain it. Who knows? It might turn downhill and make the quarter mile trek to the large, deep wetland as the base of the hill. Having been part of the call for reduced runoff into the park, along with Burlington’s Conservation Commission and Planning Board, we can’t now complain that the runoff is reduced. And now a baby turtle is wandering the park looking for a new home.